She is an antagonist in Toaru Majutsu no Index : Kanzaki SS. She has a very long and curly blonde hair and her clothes are strange in some way. She wears a feathered cap, one piece dress, pants, knee and elbow guards, and a breast plate. It looks really messed up, but in the magic sense, her clothes form a set of medieval armor. The weapon that she used is a Claymore, which is a huge sword that can deal substantial damage even without any sort of skills or tactics. However, it is clear the Brunhild is skilled at using the sword. 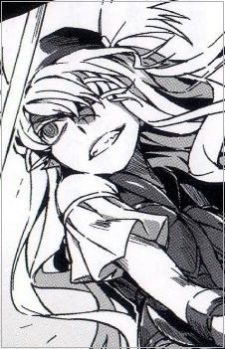 At the end of Toaru Majutsu no Index: New Testament volume 3, Brunhild is mentioned in a way that implies she will appear in upcoming volumes.